Are you a fan of Gospel Music?? Are you a member of a Gospel group?? Create a homepage, connect with fans and promote your upcoming Gospel events for FREE!! Are you a promoter of Gospel concerts?? It's simple. Gospel groups, local and professional, from all over the country, are encouraged to post their concert dates on GospelGigs.com. As a member, once a week, you will receive an e-mail showing you the Gospel groups that will be performing in your area. Not your state or your region of the country, but in your very community, your city, and however far from your zip code that you are willing to drive. You set the preference of what concert dates that you want to know about. And they are all delivered, once a week, to your e-mail box. The best part...it's FREE!! To get a better understanding of Gospel Gigs and the story behind it, go to About Gospel Gigs. 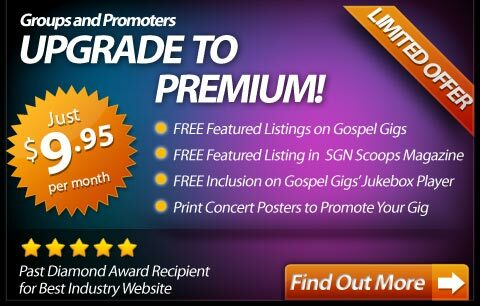 Add a Gospel Gigs Banner to your website! Is this your zip/postal code? Shop for Gospelgigs Stuff !